Red Tide cleanup expected this weekend at Sebastian Inlet and Vero Beach, Florida. SEBASTIAN – All beaches in Indian River County remained closed Thursday, except for Round Island Park, as the county plans to assess the damage caused by Red Tide. County officials tell Sebastian Daily that the town of Indian River Shores and the town of Orchid are currently procuring a contractor to conduct a countywide effort to remove marine debris from the beaches. On Monday, Red Tide was spotted in Vero Beach at John’s Island and Indian River Shores. Florida Fish and Wildlife Conservation Commission and the health department in Indian River County took samples to test for Red Tide. On Tuesday, Red Tide was spotted at Wabasso Beach after numerous people complained of ill symptoms associated with the toxins. Lifeguards were seen wearing masks. 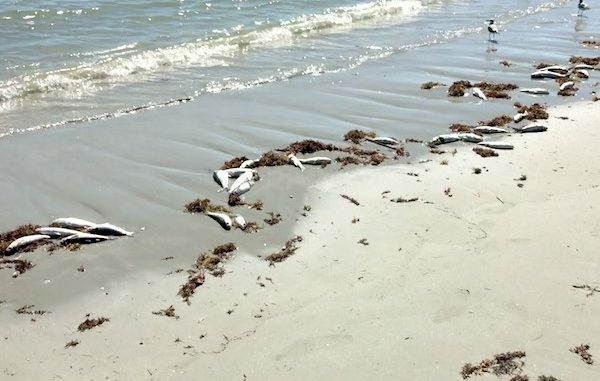 On Wednesday morning, Red Tide was at the Sebastian Inlet State Park where dead fish and other sea life were found on the shorelines at the beach and Tide Pool. FWC and Indian River County reported the presence of Red Tide from their water samples and closed all local beaches. On Wednesday night, FWC confirmed that low amounts of Red Tide were in the Indian River Lagoon. So far, there hasn’t been any dead fish or ill symptoms related to Red Tide. On Thursday, we haven’t seen any problems in the Indian River Lagoon. We will continue to bring you updates. Are bicycles allowed on sidewalks in Sebastian?